James W. Kisling describes the inauguration of Woodrow Wilson as president of the United States. March. Wilson Inauguration. Sunday morning, March 2 I walk to Leesport en route to Washington, D.C. At Leesport I am joined by Thomas Faust and Milton Hetrich as per pre-arrangement. From there we journey together going via Penna. R.R. 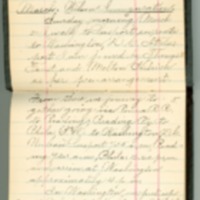 to Reading; Reading R'y to Phila; B. and O. to Washington, D.C. We leave Leesport 7.55 a.m., Reading 9.25 a.m., Phila. 12.20 p.m. and arrive at Washington approximately 4 p.m. In Washington we put up at Nolan's, 616 H St. N.W. After having established ourselves here, we go to the Capitol, where, seated in the gallery of the senate chamber, we listen to senatorial argumentation. Then, we feast our eyes on the beauty of the inside of the Library of Congress, the beautiful of the beautiful of all the buildings in the world, this side and other side of the Atlantic, I have seen. It is a revelry of the beauty of architecture, sculpture and painting, a monopoly of such revelry!Next day, Mon.,I am in the “East Room” of the White House, entering this part after having come up from the floor below. This room seemed so much smaller than it seemed to me 16 yrs. before when I was in the White House on the first day I was old enough to be President of the U.S. After having strolled through this famed hall the second time I descended to the lower floor where I viewed a number of other rooms of national and historic interest, together with their appurtenances of art. After having quenched my thirst with White House water at the civilities of the guard, I left this home of the head of the nation and proceeded to the Court of Honor on the side of Lafayette Square to locate my seat reserved on the “Princeton stand.” (Seats not numbered or sections not lettered then.) Go to the Shoreham hotel, register as a Princeton alumnus, secure my badge indicating this distinction as well as get my Princeton reserved seat ticket, and card admitting me to the Princeton reception and smoker given by the Princeton Alumni Association of the D.C. in honor of Woodrow Wilson, Princeton '79, and President-elect of the U.S. See the suffragette parade which is very late starting, presumably because the women stuck fast to looking-glasses. The time was close to 3 p.m. Well, to be sure, it was a show of colors and lace, of breastworks, (and some legs, if I remember, Apr. 21.). Go to Union station and see President-elect Wilson arrive. Then I return to Penna. Ave. to see the rest of the women's parade, which also involved some men on foot, slaves of the women, likely, or, at least, propitiators of them—even cringing congressmen. Again I am a spectator in the galleries of congress. Judging from the large number of seats allotted to women or the many entrances for “ladies” to the galleries, and the small number of such for men, one might think that women instead of men were wielding the ballot and making the laws in the U.S. But in America men are women-mad as women are dress-mad. From 8 p.m. until midnight I am in a hall on the 10th floor of the New Willard hotel attending the reception and smoker given to Princeton alumni by the Princeton Alumni Association of the District of Columbia, in honor of President-elect of the U.S. Woodrow Wilson, and members of the Princeton class of 1879. Stationed in the gallery played the Annapolis, or Marine Band. The air was sweet with melody and harmony, alive with the babel of a thousand tongues; the whole scene beamed forth festivity. But it was a festivity charged with an immense solemnity inspired by the chief guest of the occasion who, in his triumphal progress since the presidential election had now come to the pass where the rosy road of brilliant victory turned into the thorny path of appalling duty at the nation's White House; and the thought of the impending responsibility weighed down his spirits far more than the country's highest honors buoyed them up. He entered the hall evidently embarrassed; he talked with us, but with a heavy heart stifling the lightsome; he shook hands with us as the thing he most wished to do at the function but even on this pleasure something threw a pall; he sang with us the dear and cheering songs of Old Nassau, but no, not now would cheering songs cheer him to cheering and exultating singing; he had it announced soon after his appearance on the dais that he wished to be excused from making a speech that evening, but the “boys” (for we were all “boys” except three? girls in the gallery), the “boys” would not have it that way, and Mr. Wilson yielded after a pressing request to give us an address. The speech so called forth was one of few words, but words rooted in righteousness and laden with the fruit of the burden of trust and duty. “Fellows, I had not expected to say anything,” he said, with a tremor in his voice and twitches in his face, “because the only appropriate thing to say I can't say, because there are no words for it. There are some emotions that are very much deeper than a man's vocabulary can reach; and I have a feeling to-night that moves me very much, indeed. We have often spoken of our comradeship together as Princeton men, and I have spoken so often that I am ashamed to repeat it almost, of the part that Princeton has played in public life and the part that she ought to play in public life; and I have spoken so often of that sense of having a great invisible brotherhood that binds a man by uncommon standards of honor and of service. Now, I stand here upon the eve of attempting a great task—a profoundly great one—and knowing that there are so many men in the United States who know me and understand me, and to whom I do not have to explain anything. Members of the family do not have to be told what is going to happen. And therefore it is not necessary to make a speech to the family. “I have only to say that my feeling to-night is a family feeling, of being among men trained as I was trained, looking out upon life as I look out upon it, and ready to give me that sympathy which buoys a man up more than anything else in the world. I thank God it is so and thank you profoundly for this evidence of it.” After the President-elect had been escorted through a lane in the throng of the fellow alumni in the New Willard hotel hall amid deafening cheering he, as an alumnus, was presented a package consisting of cigars, cigarettes and a book of Princeton songs, a package such as each one of the rest of us alumni received. This to him appealed like a joke, for he does not smoke, and evoked a smile, the only smile to break through his heavy heart that night, to my knowledge. The presentation was made through the hands of Henry Clay Stewart, '84, president of the local alumni association, and Justice Mahlon Pitney, 79, of the U.S. Supreme Court. In passing through the avenue walled in by his fellow Princeton alumni, to the platform in the reception room, Mr. Wilson was closely attended by his body-guard of the secret service.(? ); and as each one of us filed past the President-elect to shake hands and offer congratulations, there stood on both sides of him close by his side, men who closely watched each one as he came up to and passed him, one of these guards probably the aid, never letting his eyes stray from the hands of those about to grasp the hand of the President-elect. So inconspicuously was this watching done that I was not aware of it when my hands were eyed and only saw the dropping of the guard's eyes on the hands of others who came after me in the line when my attention was specially called to it by a fellow guest. Besides the Princeton “locomotive” cheers and the Marine band to pour life into the affair there was the Princeton glee club. Among other men of national prominence to deliver short addresses, was Mr. Wilson's successor in the gubernatorial office of New Jersey, Mr. Fielder. This man, he Fielder remarked, had a reception in another part of the building from which he, for the time, absented himself; an affair, said he, not much below ours, the Wilson reception, in quality, though smaller in magnitude. Our host, the Princeton Alumni Association of the District of Columbia, spared no pains and lavishly spent money, to entertain us, making arrangements for us for weeks before our coming: as to housing quarters, referring us to the Washington Committee on Public Comfort, etc; as to viewing the inaugural pageant, securing for us, upon payment of a stipulated price, a seat on the covered and adorned Princeton stand in the “Court of Honor” just across the street from the President's reviewing stand; as to the reception, securing the hall with its incidentals, presenting to each one a package artistic and costly of content, furnishing refreshments in quality the best, in quantity to overflowing—tobacco to stack—in variety to more than necessity. The wounds inflicted in the Princeton fighting in which the forces arrayed against each other were generaled by President of the University, Wilson, and Dean of the Graduate School, West, it seems, impressed themselves on the extraordinary sociable, for neither the trickry, demagogic, Dean nor the incumbent of the presidential chair of the University, Hibben, were present; while of all the professors I learned to know as undergraduate of the institution, I saw and spoke to but two, excluding the President-elect of the U.S., in the gathering, namely, Harper and Daniels. Of my own classmates, as I recall it, I met three that evening, the Rigg brothers and “Belva” Lockwood. Of the class of '93? Of those I knew only Byers, now from Mich., I discerned present and renewed old acquaintance with him. I was more lucky in meeting a larger number of representatives of the classes of '95 and '96, boys I had learned to know at Princeton, some with few scars of Time in their faces others disfigured beyond my powers of recognition, but most with a still young heart warm with friendship for me; among these Conduit. Other acquaintances I formed ranging from those of undergraduates as represented in the glee club down to those of veterans who graduated in the years of my boyhood or even before that time. Midnight come, Mr. Wilson gone for an hour or more, but rather many of the 7 to 8 hundred guests lingering, I left the Reception and Smoker haunt after having been emphatically told as per regulation applying to each guest that once out of the hall I could not enter again that night. Upon shaking hands with the President-elect he asked me for my name which, of course, in sixteen years busy time—for I shook hands with the man and talked with him last in Baltimore 1897—vanished among the many others that are associated with his acquaintanceship for the interim. “I am glad to see my teacher on the eve of his eminent promotion,” I said. “Thank you,” he replied. March 4, in the morning, I went to the “Court of Honor” to located my seat on the Princeton stand—that is, in the Princeton section of the grand stand on the Lafayette-square side of the “Court of Honor.” Next I went to the east side of the Capitol to see Wilson take the oath of office for the Presidency of the U.S. Then came a long waiting for the ceremony in a vast sea of humanity; longer still, because a lazy, unscrupulous congress put off its work to the last hours, work it could and should have done before, but then could not do until 12 o'clock at noon, and so stealing a march upon the conscience of the American public by defying the God of the sun and the constitution of the Republic, they turned back the clock of the United States government to put off the natural death of the United States congress. Of course, the calloused conscience of this free people has often condoned such an act of anarchy of its representatives in the national capital upon inaugural occasions.After having seen Mr. Wilson taking the oath of the presidential office of the United States and beginning his inaugural address, I returned to the Princeton stand.While waiting for the inaugural process in front of the Capitol in a vast sea of humanity which, surging to and fro, would sweep individuals packed like sardines whereever the surges would go, everybody seemed happy in spite of wave and pressure, and while sometimes one would fear the frail frame of the female would be crushed by it, she was tickled to laughing by the squeezing, especially if the body contiguous to hers was that of an inviting male. Now and then an excessively selfish spectator would bob up who would plant himself or herself so as to unnecessarily obstruct the view of others. These, mostly, would yield to the gentle protests of their victims and would come down from their obstructing positions of vantage. A few needed harsher treatment before being brought down. Of these, some yielded to Latin innuendos; other required scourging in Anglo-Saxon; still others had to have their ribs poked as well as their hats with an umbrella or a cane, even women participating in administering these indignities, a young lady from England by my side having requested and been given my pennant cane used the same, to my surprise, in trying to bring down the hat of an obstructionist. All offenders took their medicine without much show of resentment. Finally all cases yielded, all but one. This most stubborn, unyielding case was a girl of sixteen or eighteen years of age. This was a Princeton inauguration. For not only did one now become President of the United States who formerly was for many years of his life first student, then professor and lastly president of Princeton University, but thousands of his fellow alumni wearing the colors of Old Nassau, the orange and black, mottled the crowds everywhere with these colors, while a thousand undergraduates of Princeton the host and bodyguard of the President-elect en route to Washington contributed magnificence and splendor in the mighty pageant on the march, the inaugural parade. Then not only were these colors worn by the academic body of Princeton men but the endemic spread to alien and layman of the inauguration to such measure as to trun into an inaugural epidemic. Princeton colors were the inauguration colors. [The young lady who asked to have my pennant cane to dislodge the obstructing hat of an obstructionist in the crowd on the plaza east of the Capitol, herself wearing not so big a hat but so dangerously big a pin in it as to endanger the person of one close to her in the squeeze, I asked her upon perceiving my exposure to it to adjust the menacing instrument a foot long and of a half foot projection so as not to be so threatening. She at once kindly responded by removing the entire roof. Her mother, her chaperon, noticing this, too removed her hat; while other women in the immediate company followed suit courteously.] Soon after my return to the Princeton stand the presidential party including Vice President Marshall, Ex-president Taft and President Wilson, came driving through the Court of Honor on their way returning from the Capitol to the White House, as the inaugural address of President Wilson was uncommonly brief. Then and until the presidential company had returned from luncheon in the Executive Mansion the parade halted outside the Court of Honor. With the appearance of the President on the reviewing stand the signal was given for the street pageant to move. After that for more than four hours in one continuous stream broad as the street was wide poured a spectacular mass of humanity, by far the most magnificent inaugural parade in history. The evening twilight came, then darkness of the night but men kept streaming on in the brilliancy of the electric light. Then came the hour between 7 and 8 o'clock at night, and for 15 min. more the forces of the street were moving as before past the White House, through whole companies had left the line of march when still far from the Court of Honor, while still others never entered the line, it is said, on account of the lateness of the hour—only then came the parade to an end, but to an untimely end.As President Wilson, Ex-president Taft and Vice President Marshall in their carriages approached the Princeton stand, we Princeton men waved our colors and gave deafening “locomotive” cheers, first for Wilson, then for Marshall and lastly such a cheer still less voluminous, for Taft. The old familiar greeting of the “family” met a warm recognition in the person of the chief, the President of the United States, who lifted his silk hat bowed and smiled persistently. Mr. Taft was not so responsive; neither were his plaudits so convulsive, so that he may not have noticed them. Besides, he was the vanquished chief in the triumphal procession and wasn't much on the alert for any. But his phenomenal, unprecedent defeat together with four years of official work in the White House did not carve any lines of grief and care in his face as did the cares of office in his second administration impress themselves on Pres. Cleveland who, though stoic in disposition, looked care-worn indeed at the inauguration of President McKinley in 1897. Many one-day excursionists, I learn later, reached and left Washington in such a way or at such time so as only to be able to see the crowd of human beings but very little besides, excluding seeing the buildings on the outside, at long range, moreover. Mr. Wilson, it is said, never was inside the White House until he entered it as the chief servant of “Uncle Sam.” By night or before the national inaugural pyrotechnic display Washington seemed deserted by contrast with its thronged condition a few hours before, though many thousands of visitors still remained In deference to the expressed wish of the President-elect the customary Inaugural Ball was without honor on the inaugural programme, and so did not take place. The absence of this, heretofore the social function of an inauguration, was a blight of the night to society. “Blue-blooded” women could not now advertise their lewdness through their nakedness, or nakedness in part disguised by cobweb dress, their lewdness, emphasized by suggestive gestures in the dance. The “turkey trot,” the “tango” and allies could not disgrace the morals of the Wilson Inauguration.The Inaugural Address:“There has been a change of government. It began two years ago, when the House of Representatives became Democratic by a decisive majority. It has now been completed. The Senate about to assemble will also be Democratic. The offices of President and Vice President have been put into the hands of Democrats. What does the change mean? That is the question that is uppermost in our minds to-day. That is the question I am going to try to answer, in order, if I may, to interpret the occasion.“It means much more than the mere success of a party. The success of a party means little except when the nation is using that party for a large and definite purpose. No one can mistake the purpose for which the Nation now seeks to use the Democratic party. It seeks to use it to interpret a change in its own plans and point of view.“Some old things with which we had grown familiar, and which had begun to creep into the very habit of our thought and of our lives, have altered their aspect as we have latterly looked critically upon them, with fresh, awakened eyes; have dropped their disguises and shown themselves alien and sinister. Some new things, as we look frankly upon them, willing to comprehend their real character, have come to assume the aspect of things long believed in and familiar, stuff of our own convictions. “We have been refreshed by a new insight into our own life.“We see that in many things that life is very great. It is incomparably great in its material aspects, in its body of wealth, in the diversity and sweep of its energy, in the industries which have been conceived and built up by the genius of individual men and the limitless enterprise of groups of men. It is great, also, very great, in its moral force. Nowhere else in the world have noble men and women exhibited in more striking forms the beauty and the energy of sympathy and helpfulness and counsel in their efforts to rectify wrong, alleviate suffering and set the weak in the way of strength and hope. We have built up, moreover, a great system of government, which has stood through a long age as in many respects a model for those who seek to set liberty upon foundations that will endure against fortuitous change, against storm and accident. Our life contains every great thing, and contains it in rich abundance. “But the evil has come with the good, and much fine gold has been corroded. With riches has come inexcusable waste. We have sqandered a great part of what we might have used and have not stopped to conserve the exceeding bounty of nature, without which our genius for enterprise would have been worthless and impotent, scorning to be careful, shamefully prodigal as well as admirably efficient. “We have been proud of our industrial achievements, but we have not hitherto stopped thoughtfully enough to count the human cost, the cost of lives snuffed out, of energies overtaxed and broken, the fearful physical and spiritual cost to the men and women and children upon whom the dead weight and burden of it all has fallen pitilessly the years through.“The groans and agony of it all had not yet reached our ears, the solemn, moving undertone of our life, coming up out of the mines and factories and out of every home where the struggle had its intimate and familiar seat. With the great Government went many deep secret things which we too long delayed to look into and scrutinize with candid, fearless eyes. The great Government we loved has too often been made use of for private and selfish purposes, and those who used it had forgotten the people.“At last a vision has been vouchsafed us of our life as a whole. We see the bad with the good, the debased and decadent with the sound and vital. With this vision we approach new affairs. Our duty is to cleanse, to reconsider, to restore, to correct the evil without impairing the good, to purify and humanize every process of our common life without weakening or sentimentalizing it.“There has been something crude and heartless and unfeeling in our haste to succeed and be great. Our thought has been 'Let every man look out for himself, let every generation look out for itself,' while we reared giant machinery which made it impossible that any but those who stood at the levers of control should have a chance to look out for themselves. We had not forgotten our morals. We remembered well enough that we had set up a policy which was meant to serve the humblest as well as the most powerful, with an eye single to the standards of justice and fair play, and remembered it with pride. But we were very heedless and in a hurry to be great.“We have come now to the sober second thought. The scales of heedlessness have fallen from our eyes. We have made up our minds to square every process of our national life again with the standards we so proudly set up at the beginning and have always carried at our hearts. Our work is a work of restoration.“We have itemized with some degree of particularity the things that ought to be altered, and here are some of the chief items:A tariff which cuts us off from our proper part in the commerce of the world, violates the just principles of taxation and makes the Government a facile instrument in the hands of private interests.A banking and currency system based upon the necessity of the Government to sell its bonds fifty years ago, and perfectly adapted to concentrating cash and restricting credits.An industrial system which, take it on all its sides, financial as well as administrative, holds capital in leading strings, restricts the liberties and limits the opportunities of labor, and exploits without renewing or conserving the natural resources of the country.A body of agricultural activities never yet given the efficiency of great business undertakings or served as it should be through the instrumentality of science taken directly to the farm, or afforded the facilities of credit best suited to its practical needs.“Watercourses undeveloped, waste places unreclaimed, forests untended, fast disappearing without plan or prospect of renewal, unregarded waste heaps at every mine.“We have studied as perhaps no other nation has the most effective means of production, but we have not studied cost or economy as we should either as organizers of industry, as statesmen or as individuals.“Nor have we studied and perfected the means by which Government may be put at the service of humanity, in safeguarding the health of the nation, the health of its men and its women and its children, as well as their rights in the struggle for existence. This is no sentimental duty. The firm basis of government is justice, not pity. These are matters of justice. There can be no equality of opportunity, the first essential of justice in the body politic, if men and women and children be not shielded in their lives, their very vitality, from the consequences of great industrial and social processes which they can not alter, control, or singly cope with.“Society must see to it that it does not itself crush or weaken or damage its own constituent parts. The first duty of law is to keep sound the society it serves. Sanitary laws, pure food laws, and laws determining conditions of labor which individuals are powerless to determine for themselves are intimate parts of the very business of justice and legal efficiency.“These are some of the things we ought to do, and not leave the others undone, the old-fashioned, never-to-be-neglected, fundamental safeguarding of property and of individual right. This is the high enterprise of the new day: To lift everything that concerns our life as a nation to the light that shines from the hearthfire of every man's conscience and vision of the right. It is inconceivable that we should do this as partisans; it is inconceivable we should do it in ignorance of the facts as they are, or in blind haste.“We shall restore, not destroy. We shall deal with our economic system as it is and as it may be modified, not as it might be if we had a clean sheet of paper to write upon; and step by step, we shall make it what it should be, in the spirit of those who question their own wisdom and seek counsel and knowledge, not shallow self-satisfaction or the excitement of excursions whither they can not tell. Justice, and only justice, shall always be our motto.“And yet it will be no cool process of mere science. The Nation has been deeply stirred, stirred by a solemn passion, stirred by the knowledge of wrong, of ideals lost, of government too often debauched and made an instrument of evil. The feelings with which we face this new age of right and opportunity sweep across our heartstrings like some air out of God's own presence, where justice and mercy are reconciled and the judge and the brother are one.“We know our task to be no mere task of politics, but a task which shall search us through and through, whether we be able to understand our time and the need of our people, whether we be, indeed, their spokesmen and interpreters, whether we have the pure heart to comprehend and the rectified will to choose our high course of action.“This is not a day of triumph; it is a day of dedication. Here muster, not the forces of party, but the forces of humanity. Men's hearts wait upon us; men's lives hang in the balance; men's hopes call upon us to say what we will do. Who shall live up to the great truth? Who dares fail to try? I summon all honest men, all patriotic, all forward-looking men, to my side. God helping me, I will not fail them, if they will but counsel and sustain me!”March 5.Milton Hetrich, Thomas Faust and myself go to Mt. Vernon in the morning by electric road. At the old homestead of the “Father of His Country” and its Line of Presidents, we pass through the old garden with its paths beautifully lined by boxwood, tall, and 150 yrs. old, the guide said, if I mistake not. Feb., 1914; loiter in a grove of veteran trees some planted or presented by Lafayette and other men renowned for national service in the early history of our country; look into the spinning house with its spinning wheel and numerous allied antiquated machines; have a look at the exterior of Mr. Washington's carpenter shop closed to visitors, and so we do not see George's hatchet, if the building contain this treasure; survey every room in the mansion of our first President, rooms exhibiting furniture, including the bed-rooms of Lafayette, of George and of Martha Washington, the floors of some if not of all these three covered with clean, home-made rag carpet, in this respect very suggestive of the kitchen or sitting room of the present-day home in the country of a poor man or man of moderate means—the parlor, disproportionately palatial in the appointments, including a costly rug on the floor, down to the kitchen with its monopolizing fireplace and its appurtenances of massive cooking utensils strong enough, one might think, to wear for all time; drink at the pump or hydrant in a covered corner of an adjacent building, but from a modern sanitary, paper cup whose bottom comes off after its contents have been drained; from the slopes of the commanding fore-grounds of the mansion, view the charming panorama of the Potomac and its valley environs, the fountain, at one time, of enjoyment to the lord of these realms “First in war, first in peace, first in the hearts of his countrymen.”After having made a cursory acquaintance with the living witness and the haunts of the hearth of the lives of the illustrious Washingtons and their slaves as well as their illustrious guests, we walked to the haunts of the dead, the tombs of the Washingtons, nearby,—first to the original grave of George Washington a lowly vault, as to artistic built perfectly silent about the precious remains it housed, and from there to the mausoleum now holding his remains together with those of his wife and some other near relations. The first repository of Mr. Washington is located where Mrs. Washington could look from her window every day after her husband's burial. In 1831? his remains were removed to their present resting place, for the purpose of affording a better security against the theft of his ashes. The tomb with the sarcophagis of Geo. and Martha Washington exposed to view through iron gates, is constantly under guard of several men.No towering shaft marks the tomb of The Father of Our Country. Here no cold monolith affects to tell the story of his life. But haunted are the hallowed precincts that shrine his ashes, with great and noble deeds from which has issued the majestic monument of the mightiest republic!From the home of the dead we proceed to the barn on the estate and to the building in which is stored the historic carriages in which was wont to ride behind four horses the great democratic aristocratFinally we recross the Mount and leave the home of the spirit of Washington to return to his monument, the city of Washington.Shortly after midnight, March 5–6, Messrs. Hetrich and Faust and myself left the five? million dollars Union Station, Washington, to go home. Detained a long time in the Baltimore city cut owing to an accident to the air-brake mechanism or some part of the machinery of our train. Make a flying journey from Phila. to Reading on a Reading railway “flyer.” From Reading to Leesport Thos. Faust and myself go by railroad, Milton Hetrich leaving our company at Reading, and from Leesport Mr. Faust goes with Allison Lamm while I walk home to John Schock's place; and so dies the echo of the Wilson inauguration for me. Kisling, James Wellington, “James Wellington Kisling,” 1913 March 2, WWP22632, James W. Kisling Collection, Woodrow Wilson Presidential Library & Museum, Staunton, Virginia.